This breakfast is a delicious, hearty treat any time of the year. The German pancake is thicker than average pancakes and is able to be shared between two or more people. Rather than being cooked in a pan or griddle, it is instead baked which allows it to rise more and be fluffier. 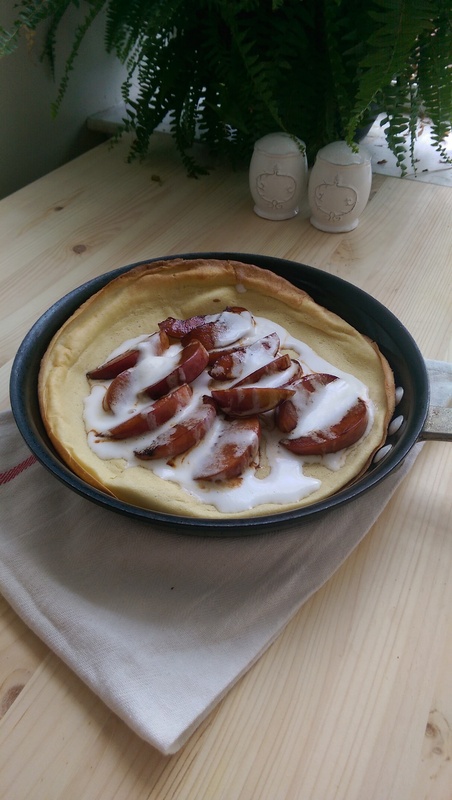 The “drunken peaches” and crème fraîche are a delectable companion to the velvety richness of the pancakes and make this an exotic way to begin and morning! Mix the cream and buttermilk in a bowl, cover with a clean towel or cloth, and let sit overnight until it thickens. Stir until it starts thickening and refrigerate. Mix the eggs, sugar, milk, salt, butter and vanilla in a bowl until nicely blended together. Add the flour and whisk until it becomes smooth. Put it to the side. While it is baking, heat up the butter over a medium-high heat and add the brown sugar. Once the sugar has melted and combined with the butter, lower to a medium-low heat and add the peaches until caramelized. Sprinkle a dash of cinnamon over the peaches. When the pancake is done, transfer over on a plate and top with the peaches and crème fraiche. I’m loving this man!! I know what I’m making this weekend!